Lancing is a minor surgical method to release pus and pressure from the affected area. It is done by making a small incision into the abscess, allowing the pus and other remains to drain out of the cyst. Once, the liquid is drained completely, the cyst is then packed with sterile gauze. 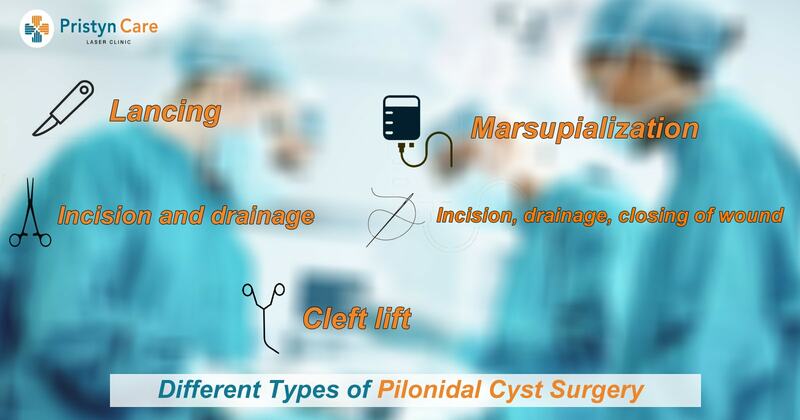 Incision and drainage is a minor surgical procedure by which the cyst is removed, but the wound is not closed. This will allow the release of pus and pressure from the skin and let it heal on its own. The recovery normally takes about two months. In this procedure, the wound is closed after draining of the cyst. Marsupialization is a surgical procedure by which your doctor will cut a slit into the abscess or cyst and suture the edges of the slit to make a continuous surface. It is done from the outer surface to the inner surface of the cyst. This will leave the wound open and allow it to drain freely. The recovery time is a bit longer in this method. Developed by Dr. John Bascom, cleft lifting is normally performed if a pilonidal cyst has failed to heal. This method involves the removal of infected tissue which is more extensive than it appears on the surface. Last but not least, It is the most effective treatments to treat the cyst without incision and scar. Being the painless treatment, it is mostly preferred by the patients as they can go back to routine activity quickly.